As Dezeen previewed earlier this week, Cocksedge has developed a method of uniting different metals through a freeze/thaw method that binds the different materials together through contraction and expansion to create a strong joint. Cocksedge shrinks the metals by applying liquid nitrogen to the different materials. He then fits the contracted pieces into the pre-cut holes or slots of the room temperature slabs to form tabletops, desktops, and seats. "These pieces are really about the making," Cocksedge said. "Not everything should be mass produced." The designer spent five years perfecting the technique, working with craftsmen in Liverpool to fabricate the pieces. At Friedman Benda he is showing three dining tables with different tops. The first piece uses only two metals: copper for the cylindrical base and aluminium for its round top. The table was the designer's first effort to use the technique on a large, heavy piece. 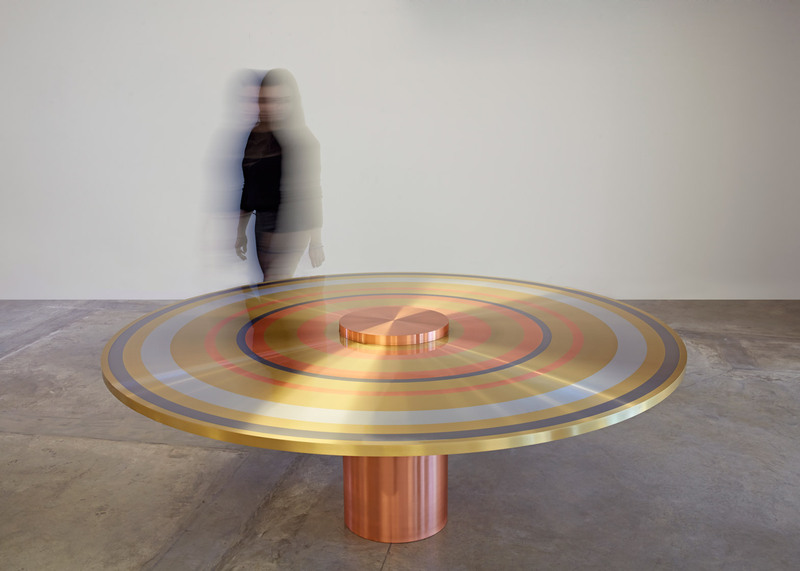 He then applied the same process to create the Ring table, which features a more complex top with concentric hoops of brass, steel, copper and aluminium – metals that can not be easily joined using conventional techniques like welding. The third, called the Multi-circle table, uses a round carbon steel top with dozens of holes plugged with stainless steel rods. The silverly stainless steel plugs contrast with the darker matte surface. Both the Ring Table and the Multi-Circle have clear lacquer-coated tops to maintain their polished finishes. Cocksedge told Dezeen he is considering doing an outdoor collection where the metals would be left unfinished and would change over time. The show also includes a bench with four seat backs that slot through the seat to double as legs. The seat backs are angled to create tête-a-tête conversational arrangements as well as provide stability for the piece. In addition, the Freeze collection includes a rectangular table with an aluminium top and four round coppers legs, and an all-aluminium side chair. All the pieces are available in a limited edition of 10 except for the chair, which is available in up to 35 pieces. Also on display is an aluminium bookshelf made with conventional joinery, called the Rhythm Shelf, which is designed to hold books and magazines of varying thicknesses. In addition, Cocksedge is showing a few pieces from his acrylic Slice collection, including a stool, bench, shelf and a large light fixture. For the Slice series, Cocksedge heats and cuts acrylic blocks then allows gravity to bend the material into shape. The cuts also create a matte finish in the otherwise clear acrylic. Freeze is Cocksedge's second show at Friedman Benda. His earlier exhibition, Capture, included a bent Corten steel table. He has previously designed large scale architectural elements, including a planted staircase in London.